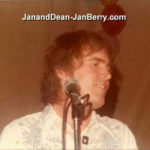 Jan Berry, ready to hit the road, 1978 — (courtesy John Grove). Gary Snyder (left), Jan Berry (center), and John Grove, 1978 — (courtesy John Grove). 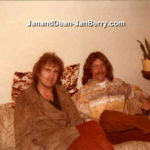 Jan Berry (left) and John Grove, 1978 — (courtesy John Grove). Jan Berry, snoozing in the motor home while on tour, 1978 — (courtesy John Grove). Norm Levinberg, road manager for the first Aloha tour, 1978 — (courtesy John Grove). John Grove relaxing in the motor home, 1978 — (courtesy John Grove). FROM LEFT: Brad Rice, Carl Brenner, Jan Berry, John Grove, and Gary Snyder, with Norm Levinberg (road manager), 1978 — (courtesy John Grove). Carl Brenner (left), Brad Rice (center), and Gary Snyder, 1978 — (courtesy John Grove). FROM LEFT: Gary Snyder, John Grove, Gene Wall, and Carl Brenner, 1978 — (courtesy John Grove). FROM LEFT: Norm Levinberg (road manager), John Grove, Carl Brenner, and Gary Snyder, 1978 — (courtesy John Grove). 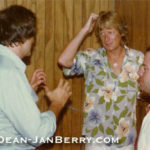 Keith Ward, road manager for Aloha’s second tour, 1978— (courtesy John Grove). 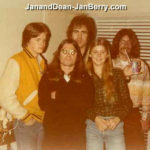 BACK ROW FROM LEFT: Carl Brenner, Brad Rice, John Grove, Gary Snyder — FRONT ROW FROM LEFT: Keith Ward (road manager), Jan Berry, 1978 — (courtesy John Grove). 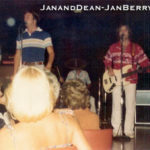 FROM LEFT: Jan Berry, Randy “Dean” Ruff, Carl Brenner, and John Grove, 1978 — (courtesy John Grove). 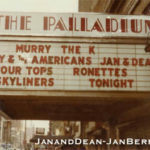 Murray the K’s Brooklyn Fox Reunion, featuring Jan & Dean, Palladium, New York City, July 15, 1978 — (courtesy John Grove). 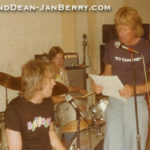 Jan & Dean, with Carl Brenner on drums, rehearsing for the Brooklyn Fox Reunion at SIR in New York City, July 1978 — (courtesy John Grove). 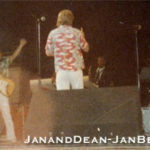 FROM LEFT: Jan Berry, John Grove, Gene Wall, Dean Torrrence, and horn players. 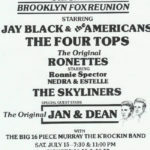 Onstage at the Brooklyn Fox Reunion, Palladium, New York City, July 15, 1978 — (courtesy John Grove). FROM LEFT: Gary Snyder, Jan Berry, Dean Torrence, John Grove, and Carl Brenner. 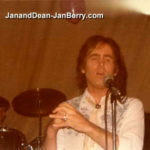 Onstage at the Brooklyn Fox Reunion, Palladium, New York City, July 15, 1978 — (courtesy John Grove). 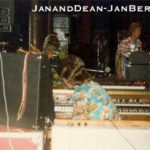 FROM LEFT: Jan Berry, Gary Snyder, Dean Torrence, and John Grove, with horn players in the background. Onstage at the Brooklyn Fox Reunion, Palladium, New York City, July 15, 1978 — (courtesy John Grove). 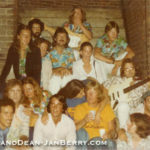 Jan & Dean, the Aloha Band, and friends after the Brooklyn Fox Reunion show, Palladium, New York City, July 15, 1978 — (courtesy John Grove). 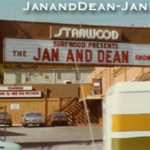 Jan & Dean performed with the Aloha Band at the Starwood club in Los Angeles, September 7, 1978 — (courtesy John Grove). 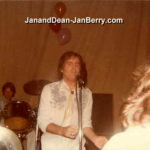 Dean Torrence joined Jan Berry and the Aloha Band for a performance at the Starwood club in Los Angeles, September 7, 1978 — (courtesy John Grove). 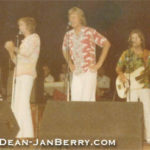 Jan Berry and the Aloha Band in concert, 1978 — (courtesy Doug Mellington). FROM LEFT: Carl Brenner, Gary Snyder, Jan Berry, Jenny Mellington, Doug Mellington, 1978 — (courtesy Doug Mellington). 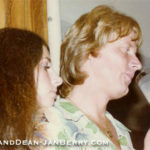 Jan Berry and Doug Mellington, 1978 — (courtesy Doug Mellington). 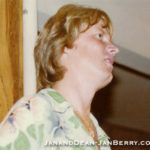 Jan Berry and Jenny Mellington, 1978 — (courtesy Doug Mellington).